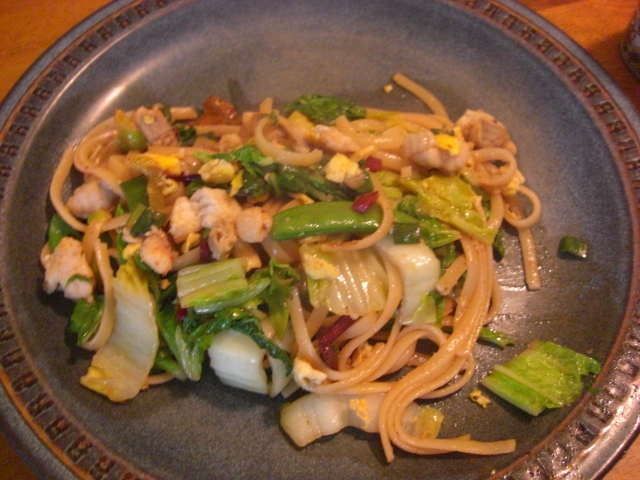 Pad thai – now with catfish! So I wanted to try pad thai again but was out of shrimp. 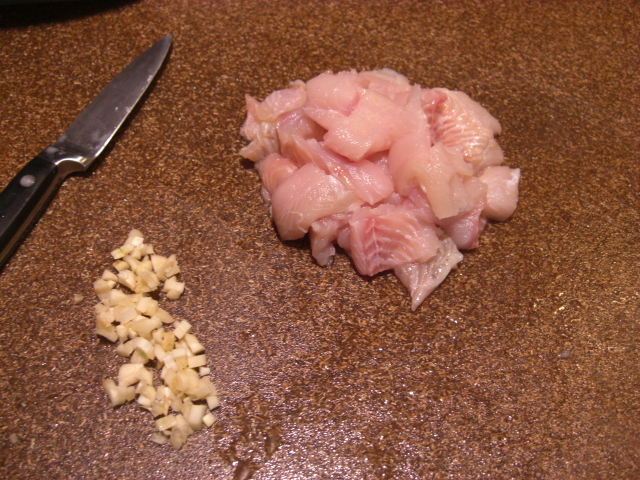 So I defrosted some catfish I bought from the Farmers’ Fresh online store and chopped up about a third of a pound in place of shrimp. 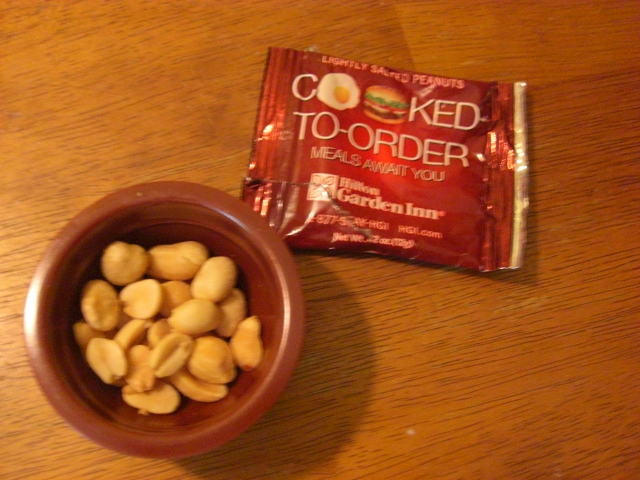 The peanuts I threw in at the last minute, however, were from a Hilton Garden Inn. I tell you that fish sauce smells terrrrrible when you add it to the pan. But it turns out pretty darn good. 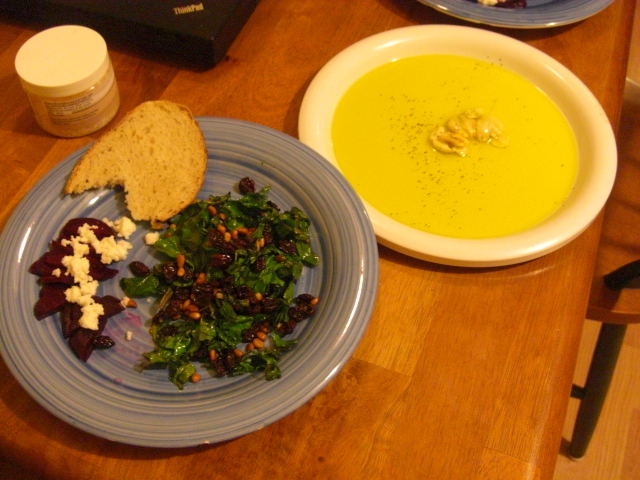 Chris and I have been totally digging Tuscan kale with raisins and pine nuts. My mom gave me this recipe years ago to try, and last year it finally took. 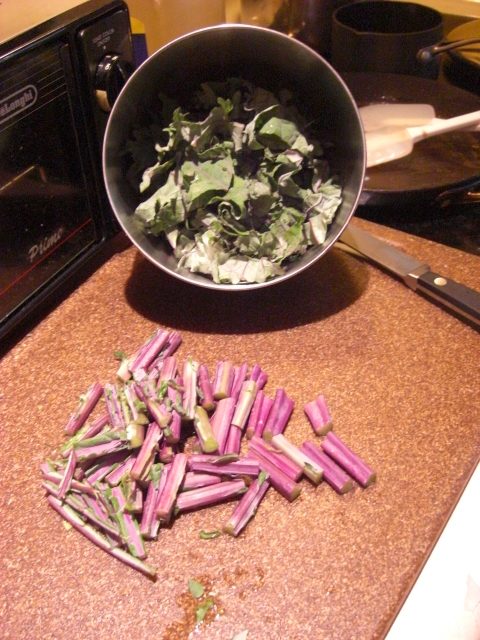 Red Russian stems are more substantial than Tuscan stems, and they don’t cook up as well. So I separated the stems and froze them in the hopes that they’ll make it in a veggie stock or something. The good news is Red Russian kale is just as good as Tuscan. Especially when served with delicious baby beets and goat cheese as well as warm bread and garlic slow-cooked in olive oil for dipping. 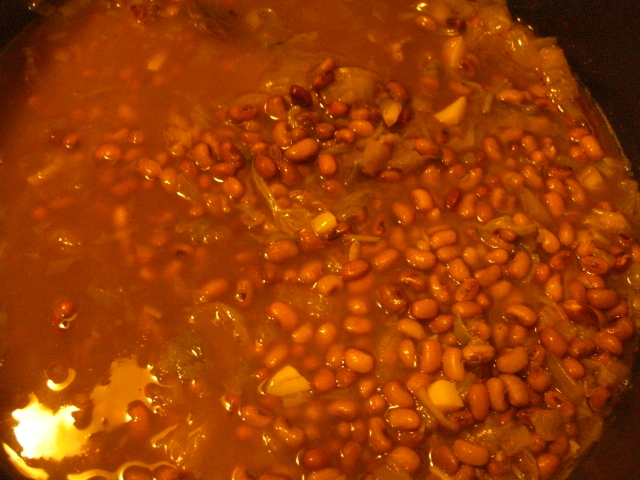 That’s what happened to me Monday when I wanted to make the red peas with this recipe from goosethemarket.com. So I had to put it off until today. Instead of jowl bacon (whatever that is), I cooked the onions in sausage drippings. A pound of sausage cooked up yields a little less than a 1/4 cup – plenty enough to cook onion and flavor peas. 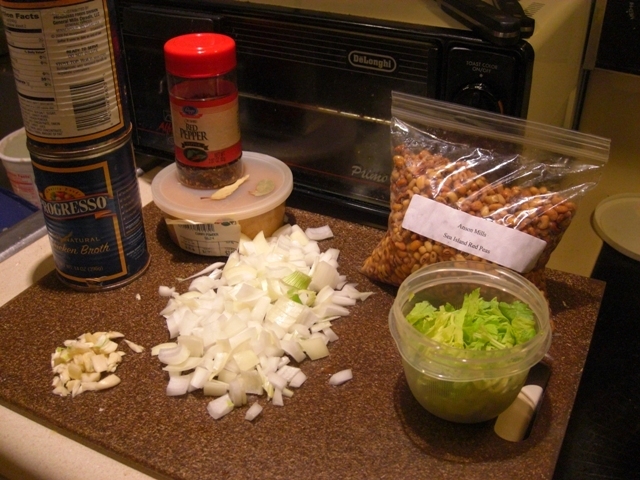 I also skipped the last step of pureeing some of the peas. Had no desire to clean my food processor when the peas looked perfectly good as they were. The results were quite tasty. We ate them with emergency goat cheese biscuits and a salad of lettuce, baby spinach, and beet greens. Looks good, as always! 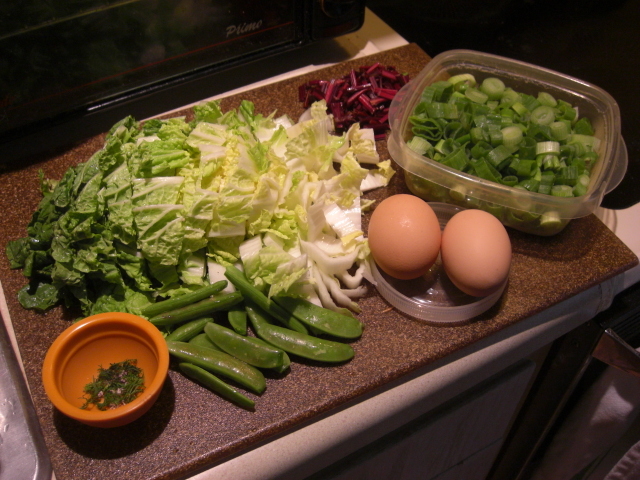 I will cook up some of those peas real soon. 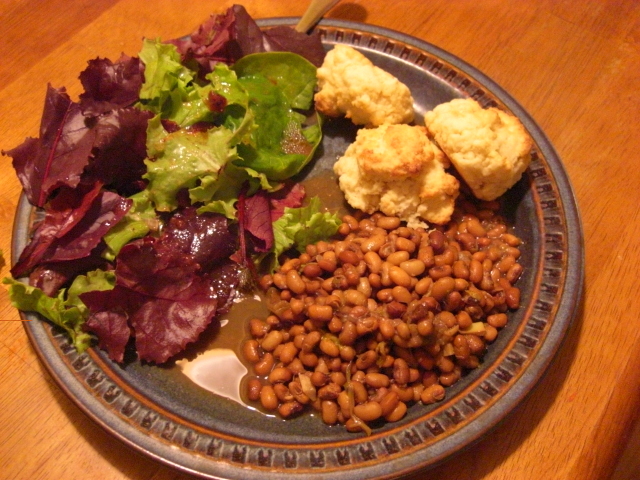 I am curious about “emergency” goat cheese biscuits though…..
Scroll down http://ansonmills.com/rice.htm to read about Sea Island Red peas. It says they are a heirloom variety of field pea. I guess since peas have been cultivated in South Carolina for centuries, it makes sense that there are a bunch of varieties. Maybe on the islands, the varieties would have been even more distinct because of the isolation. Just guessing, though!